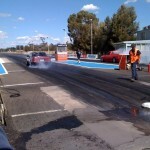 Heathcote Drags is always worth an hour or two on a Sunday to watch a line up of cars competing. 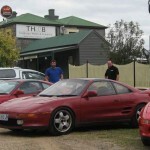 Supra’s, and AC Cobras, several Corolla’s of course, as well as the usual large array of Holden’s and Fords, along with many other makes all ready to have a go. A very enjoyable lunch at the Tooborac Hotel that has a variety of it’s own custom brewery beers, with jazz musici n the background.